Color: Orange, Purple, Ivory and Pink. Green at Bottom of Ornament. These are made for indoor and outdoor use. Add a splash of color to your water feature. 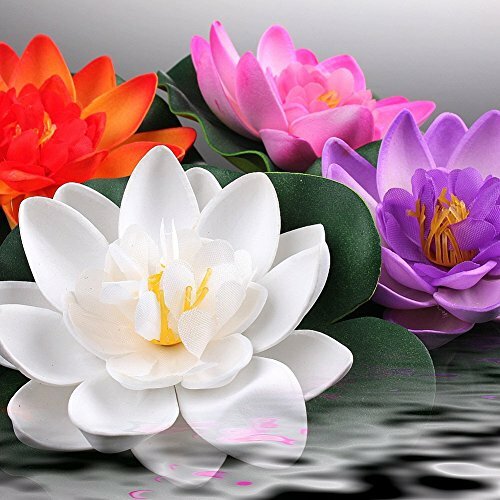 These floating water lily flowers are made of soft, flexible durable foam plastic and have a ring on the back to anchor it to a string. Float several in a pond, pool, restuarants, hotels, or any water feature. What a beautiful decor to add to your garden, patio, even interior spaces! Great for everyday use or special events, such as, weddings, garden parties, bar mitzvahs, christenings, confirmations, anniversarys, quinceaneras and brunches. etc.